The Terrace, offers an exquisite private retreat and will wow you with its classic elegance and graceful period charm. 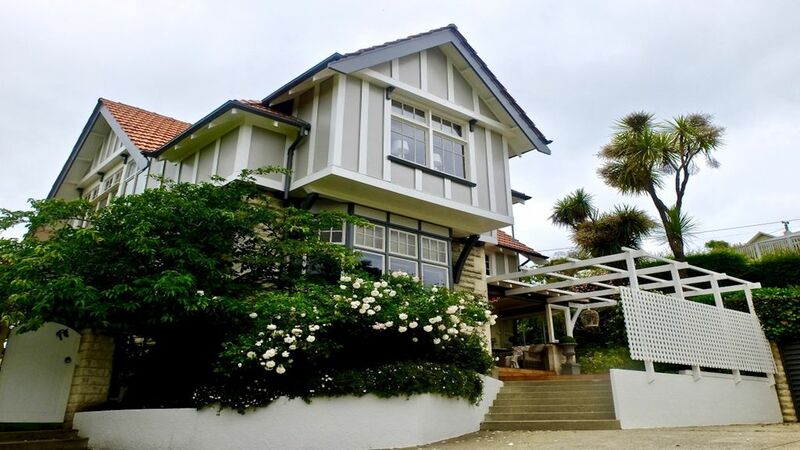 Set in beautiful English gardens and graced with captivating views of Mountain, Gardens, Town and Sea; it is one of the most beautiful and charming holiday homes available in Oamaru. Offering four large luxurious bedrooms, three modern bathrooms, additional toilet and powder room; fully equip kitchen, informal and formal dining, large luxurious living room, bbq area and fantastic outdoor living; this home is ideal for large groups and caters comfortably to a capacity of up to 12 guests. The Terrace will embrace and wow you from the moment you enter and will quite simply steal your heart. he terrace is a 100 year old English Tudor style homestead that has been newly renovated to the highest quality with all the modern comforts of home; offering exceptional entertaining and hosting facilities, great indoor/outdoor flow and the classic plushness of velvet, leather, and crystal opulence. All beds are dressed lavishly with premium linens and designer bedding and supreme attention to detail has been made to ensure all guests have a premium nights rest. Sit back on the terrace with a chilled glass of wine and take in the captivating surroundings; indulge in a fancy family feast in the glamorous formal dining setting, or simply chill out in superb comfort. The Terrace is a highly recommended experience for guests who seek something a little more special. Why not treat yourselves this Christmas.